Among many of the new features of Google products that were announced at Google I/O this year, Shared Albums was one of them. This feature was demoed at Google I/O. Photos were shared to another user via a link. You can open the link directly in the browser or on the photos app. You can then add these photos directly to your own Google Photos library. 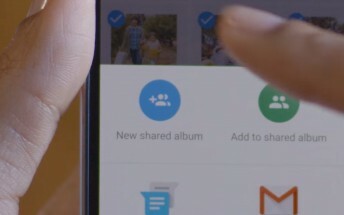 You can add photos to a shared album where multiple users can contribute to the same album. The photos app will also notify you when someone adds photos to a new album. Google Photos focuses on improving photo organization, keeping and remembering the best memories and sharing these memories with those we love. A new intro video was also posted to Youtube, demonstrating the sharing process with a Nexus 6P and an iPhone, always showing that Google also cares about iOS users. The user selects the photos and adds them to a new shared album, then she shares the link to the album with an iPhone user. Then the iPhone user adds more pictures through the Photos app and the original sharer is notified of new photos added to the shared album.